A lack of preparation leads to a string of embarrassing errors on our trip to the Black Sea and back. But if we had known what we were getting into we probably wouldn’t have gone at all. 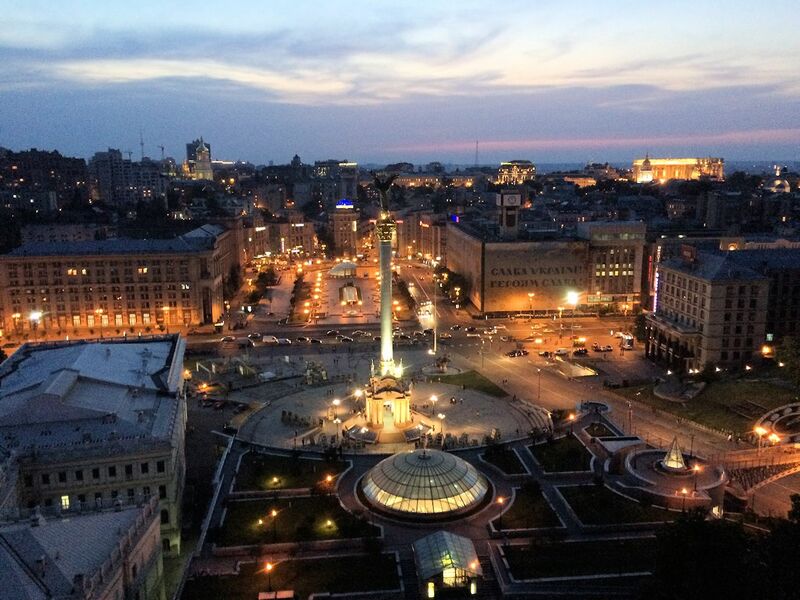 Overlooking Maidan Square in Kyiv (Kiev) from high up in the €45 per night Hotel Ukraine. More photos and map below. Not noting the mileage before we started was a beginner’s mistake. It means we can’t say exactly how many miles we covered in the sixteen days it took to drive from London to Odessa via Berlin and Kiev and back via Chisinau, Prague and Wurzburg. Retracing the route via Google Maps totals 4375 miles but doesn’t take account of all the wiggly back roads across northern Romania, or up through Hungary and across Slovakia, the Czech Republic and Austria. Overall it can’t be far off 5,000 miles. That makes it by far our longest trip though – actually – the average for the thirteen driving days at 385 miles is a long way from the 580 miles per day on last year’s Race Around the Baltic. In truth we came closer than ever to biting off more than we could chew this time. 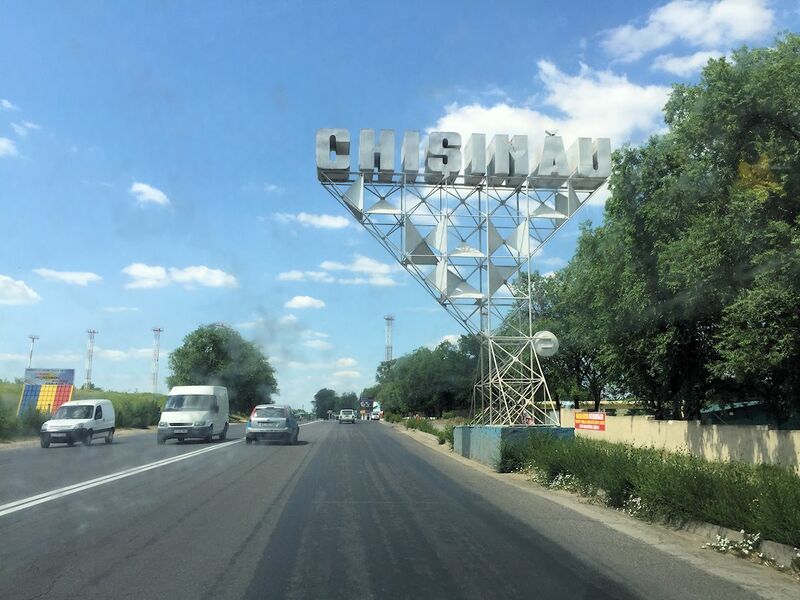 Busting a tyre, food poisoning and the slow dawning that we hadn’t planned the way back from Odessa very well – what do you mean you can’t cross from Ukraine to Romania without going through Moldova? – all conspired to make us feel like amateurs, vulnerable and a very long way from home. Saying that, driving to Ukraine is far from an Amazon-type expedition. It would be ridiculous to turn up at the border with spare tyres on the roof, for instance, or a stock of water purification tablets (though we do now feel rather cool with our Ukraine-supplied spare tyre on the back seat). Aside from all that there were lots of highlights: the Sauerland in western Germany might not touch the Alps as a skiing region but with its smooth, race track roads it does a mean impression of the Black Forest; Wroclaw (if you haven’t already been there with Ryanair for €1) is a must-see with its massive historic main square, as is the UNESCO World Heritage Site of central Lviv in Ukraine, just fifty miles from the Polish border; magnificent Kyiv (Kiev) and historic Odessa; idyllic northern Romania with groups of locals sat in the evening sun along endless one street villages with the odd horse and cart bring stacks of hay back from the fields; Levoca, another UNESCO site, in the shadow of the hugely impressive Slovakian Tatras; dozing beside the Orlice River in Pastviny coming down from the mountains into Prague; and, a night overlooking the – heated – Woerthersee Lake in Austria. Let’s gloss over the wild wine festival in the centre of historic Wurzburg, beside the Main, which was little more than a rutting, knocking shop. We made our excuses and left fairly early on. Despite the fancy hotels in Berlin, Prague and Austria, the final bill came in a just under £3,000, all-in for two people for a fortnight. A week after getting back we’re only just starting to experience the euphoric post-trip ‘burn’. Heavy-duty road trips are famously most enjoyed in retrospect, this one more than most. We might be embarrassed by our lack of preparation but the consolation is, planning the trip like we should have would likely have put us off going at all. See more on the drive through Germany, across southern Poland and down through Ukraine. 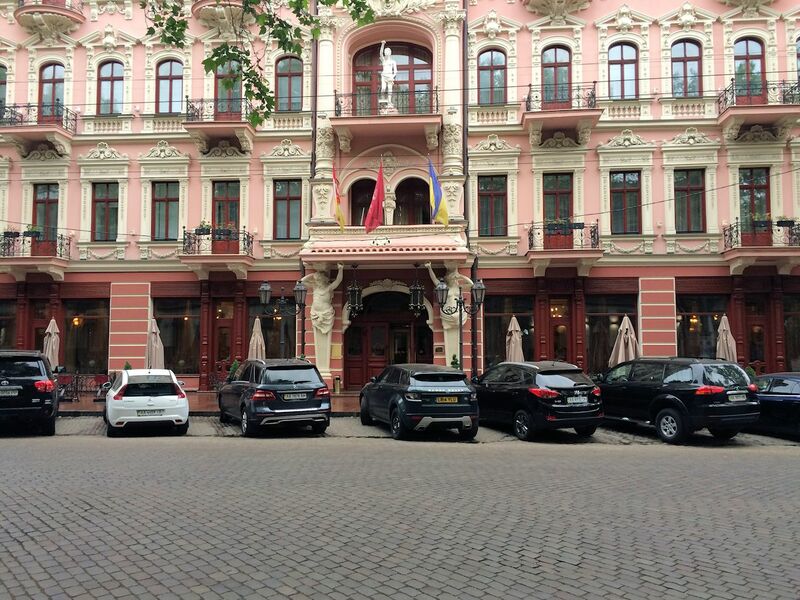 Secure parking outside the Bristol Hotel in Odessa. The outskirts of Chisinau, capital of Moldova. For the most part, thanks to loans from the European Investment Bank and European Bank for Reconstruction and Development, the roads are very good. 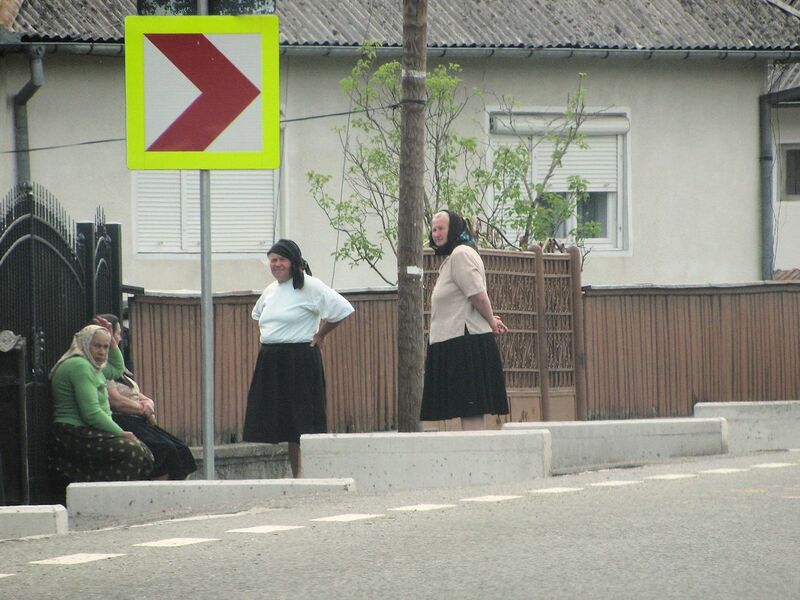 Romanian babushkas chewing the fat at the end of the day. While some Romanian roads off the beaten track leave a lot to be desired, up here to the west of the Carpathians, just to the south of the Ukraine border, they are brand new. 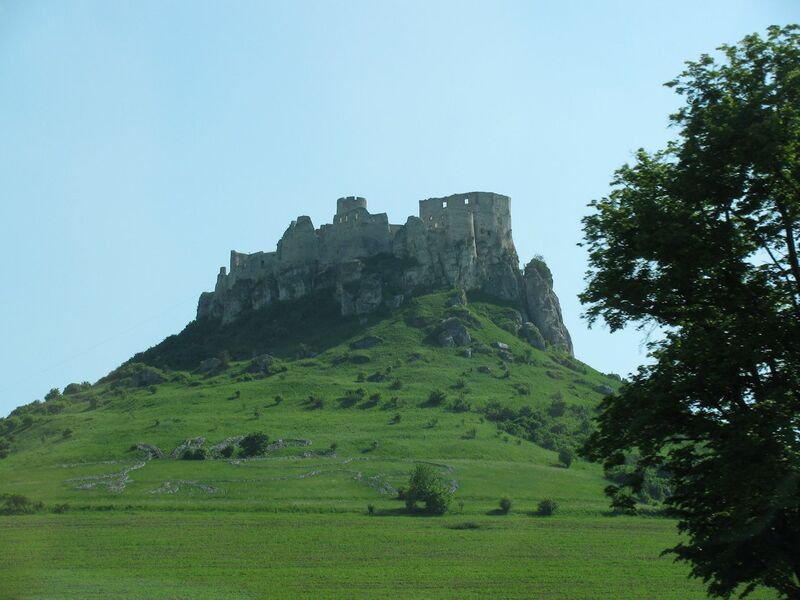 The ruins of Spis Castle seen from the under construction D1 motorway in eastern Slovakia, just a few miles from Levoca, a UNESCO World Heritage village, and the windscreen-filling Tatra mountains. We stopped for coffee at Hotel Stela, in Levoca’s central square, which boasts a galleried open air dining courtyard. Rooms from €59. Lovely Linz, on the Danube, thirty miles south of the Czech border in north central Austria. 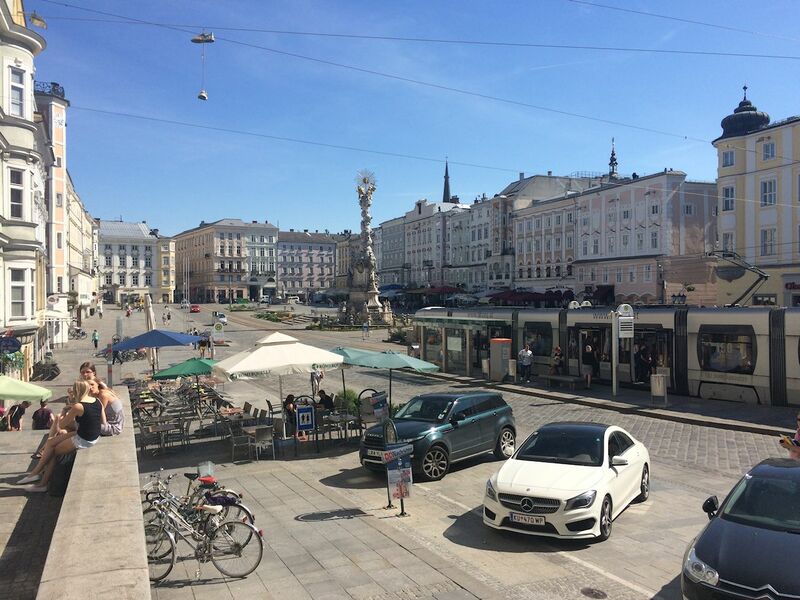 Although mainly pedestrianized there is a one-way road through Hauptplatz in the city centre and a couple of parking places in the south west corner. A perfect spot for lunch on the way to the mountains. What were we thinking? 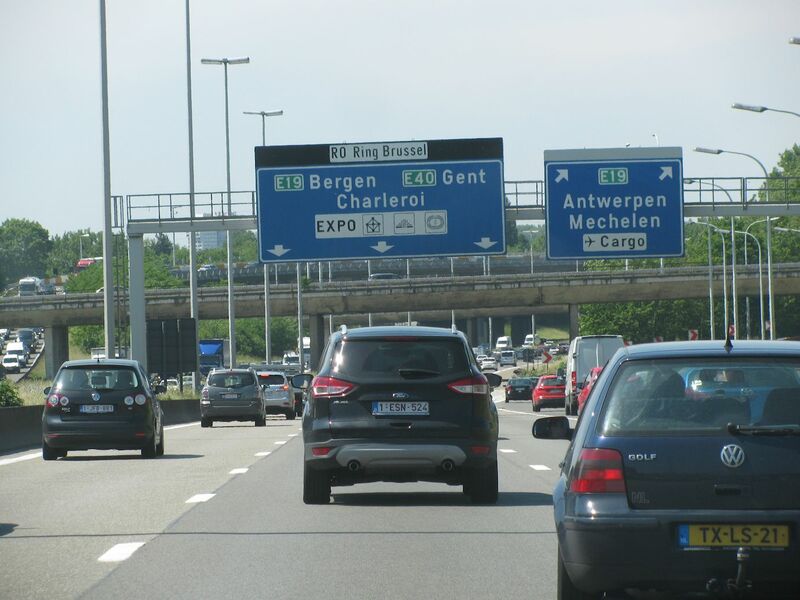 Instead of heading to the Channel on the much quieter E42 via Charleroi – the same way we came out – we decided to head back via Brussels, on the notorious R0 ring road, on a Friday afternoon – at 36⁰C, the hottest day of the year so far – and duly paid the price in a massive traffic jam. Sharing the E40 to Ostend with thousands of jostling Belgians desperate to escape to the coast for the weekend is not an experience we ever want to repeat, but it was a fitting end to this trip.